The Corruption Blog: Zambia disbands graft team that prosecuted Chiluba! Zambia disbands graft team that prosecuted Chiluba! Since we previously did the Chiluba story on this blog - thought this latest release from the Associated Foreign Press of interest. LUSAKA — Zambia will disband the anti-graft team that prosecuted ex-president Fredrick Chiluba, drawing accusations Friday that the government was seeking to bury the case two months after his acquittal. Vice President George Kunda told parliament late Thursday that the special task force created to investigate corruption allegations against Chiluba would now become part of the Anti-Corruption Commission (ACC). The previous government of the late president Levy Mwanawasa had created the task force in 2002, saying the commission did not have the capacity to investigate complex cases. But Kunda said all cases handled by the task force will be handed over to the ACC. "Under this policy, the anti-corruption commission shall be the lead institution in the fight against corruption," he said. Anti-graft watchdogs denounced the move as a politically motivated, saying it cast doubt on current President Rupiah Banda's commitment to rooting out graft. "This whole decision was politically motivated and meant to stop people from talking about the acquittal of Chiluba," Transparency International Zambia president Reuben Lifuka told AFP. "This is a clear testimony that the government is not serious in fighting corruption," Lifuka added. 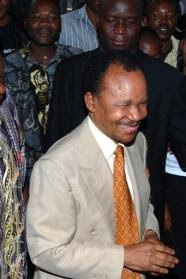 In August, Chiluba was acquitted on charges of misappropriating 500,000 dollars in public resources as he developed a taste for tailor-made shoes and suits. The executive chairman of the task force, Max Nkole was sacked a week after the acquittal and his effort to appeal the ruling was quashed. Given Lubinda, head of the African Parliamentarian Network Against Corruption, said the move showed government was not serious about the fight against corruption and would tarnish the country's image. "The government is to blame for the bad image created to the outside world. Since the death of Levy Mwanawasa," he said. "Zambia's image as far as corruption fight is concerned has been dented. They have decided to disband the task force because they want to protect their friend Chiluba," Lubinda said.